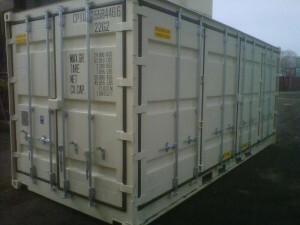 This week we’re going to spotlight a very useful specialty container – the 20’ open-side container. 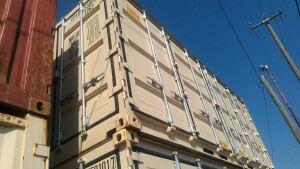 Open-sides are a really great option when you need to have full access on the 20’ side of a container. They have 2 standard doors like a standard 20’ container plus they have two bi-fold doors that opens one full-20’ side of the container. Sorry, these don’t come in 40’ long because of structural issues. These containers have so many great uses, particularly for retail space, and require less modifications than a standard container. Since these containers are not as common, they are only available as one-trip containers. They very rarely come back up on the market as a used container. Also, they are only available in certain cities. However, we currently do have 5 open-side containers in Chicago that are only slightly used. To see the pictures larger, click on them. Our question today – what would you do if you had an open-side container?